This photo is from the same Splash meeting as one some month ago. It was well accepted on PJ exhibitions. Mohanan's photo last month has given me the first part of idea. The second part I've seen on one jurying of local exhibition also with a swimmer. So, here's the result. Camera Panasonic FZ-50, built-in lens at 100 mm, ISO 100, F5, 1/1000. 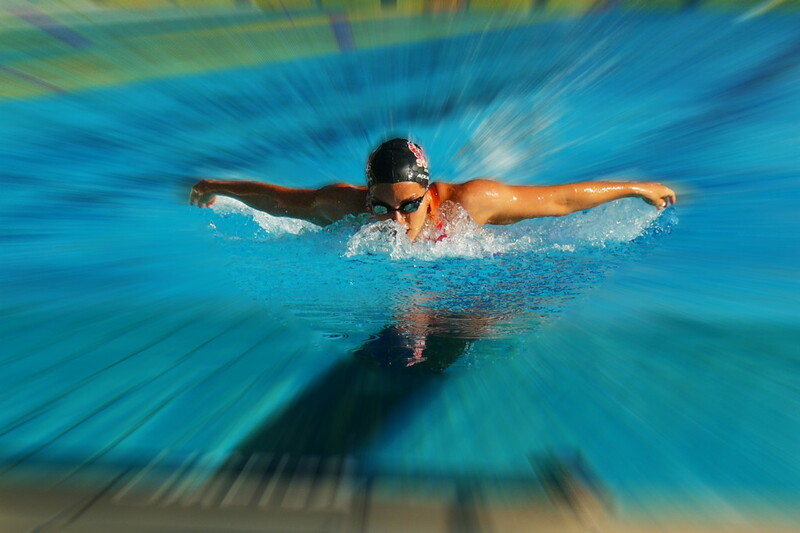 Processing: crop to center the image, selection of the swimmer and some water in front, radial blur out of selection, spot correction on the border of radial blur, contrast improovement with levels and curves, everything in Photoshop Elements. This round’s discussion is now closed! Great improvement of the original shot. I would like to see the shot cropped so the front walkway is not included in the blur. Good selection of an image to use this type of creative tool. It works well. Good job in your post processing.